A 1-cup serving of canned, ready-to-eat split pea soup may contain as much as 965 milligrams of sodium, or over 40 percent of the 2,300-milligram daily sodium limit recommended for healthy adults. 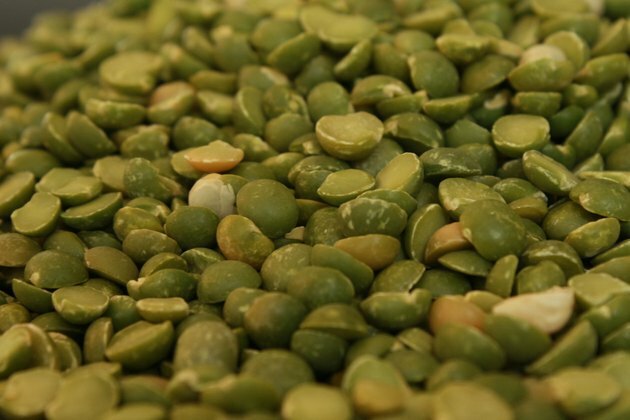 By preparing split pea soup at home, you can significantly decrease the amount of sodium per serving. In addition, you can experiment with vegetarian versions and include vegetables such as carrots, celery and onions for extra nutrients and fiber. A typical 1-cup serving of homemade split pea soup that contains chopped ham from ham hocks, ham shanks or diced boneless ham has approximately 400 calories, and about 54 of these calories come from fat. Homemade split pea soup with ham may contain around 1 gram of saturated fat and 20 milligrams of cholesterol. 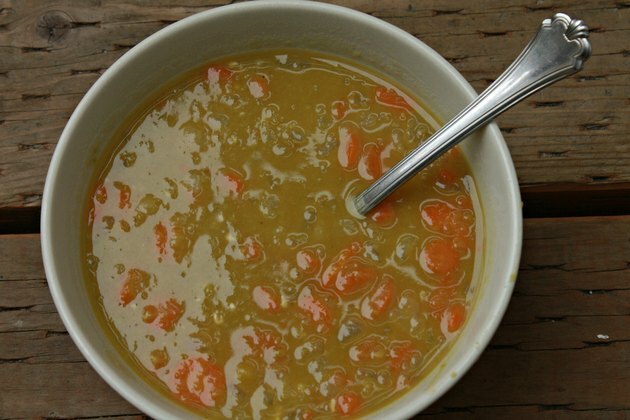 By contrast, split pea soup prepared without ham has just 115 calories, no cholesterol and only trace amounts of fat. 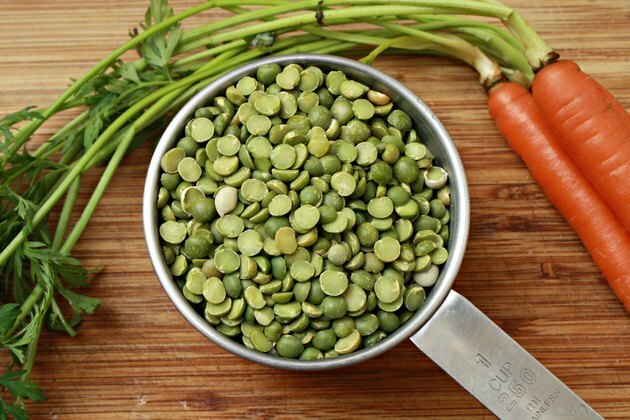 Split peas, like other legumes, are high in fiber, and split pea soup is a good source of complex carbohydrates, especially homemade versions that include plenty of chopped vegetables. 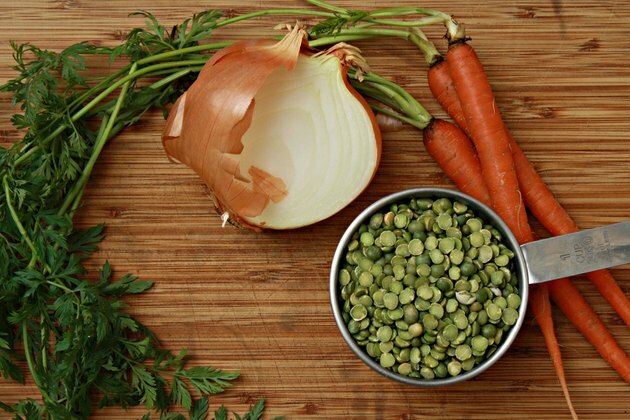 A 1-cup serving of one "Better Homes and Gardens" recipe for homemade split pea soup with carrots, celery and onions contains 49 grams of carbohydrates, 19 grams of which are provided by fiber. The soup is naturally low in sugar, with only 8 grams in every cup. If you make homemade split pea soup with ham, each 1-cup serving will typically contain between 25 and 35 grams of protein, making it an extremely high-protein dish. Vegetarian versions of the soup contain less protein: approximately 7 grams per 1-cup serving. 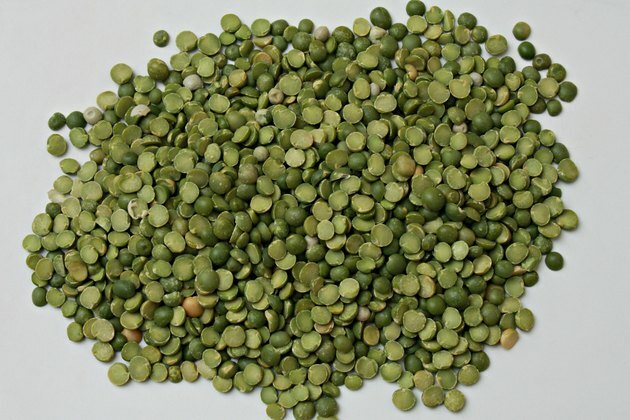 Split peas are not a complete protein, though as long as you consume a variety of grains and produce throughout the rest of the day, you'll be able to meet all of your protein needs without animal-based products, assures the Centers for Disease Control and Prevention. Vitamin A is needed for the production of rhodopsin, a visual pigment that allows the visual receptors in your eyes to detect light. Without adequate vitamin A, you'll be more likely to develop night blindness or eye disorders that can lead to permanent vision loss. 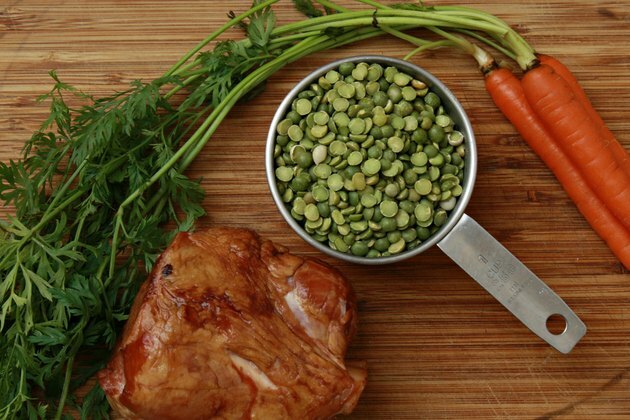 A 1-cup serving of homemade split pea soup may contain over 2,000 international units of vitamin A, or more than 50 percent of the amount of the nutrient healthy men and women need each day. Split pea soup also contains smaller amounts of vitamins such as folate and vitamin C.
Legumes and vegetables are high in potassium, and each cup of homemade split pea soup may supply over 20 percent of the recommended daily intake of the mineral for adults. The Linus Pauling Institute reports that a diet rich in potassium may help lower your risk of high blood pressure. To maximize the benefits you can receive from the potassium in split pea soup, keep your sodium intake under control -- eating too much sodium and too little potassium may increase your chance of developing heart disease. Use low- or no-sodium broth when preparing split pea soup and avoid adding salt at the table. What Are the Benefits of Pea Soup? What Are the Benefits of Spinach Soup? Is Chicken Noodle Soup Healthy for You?